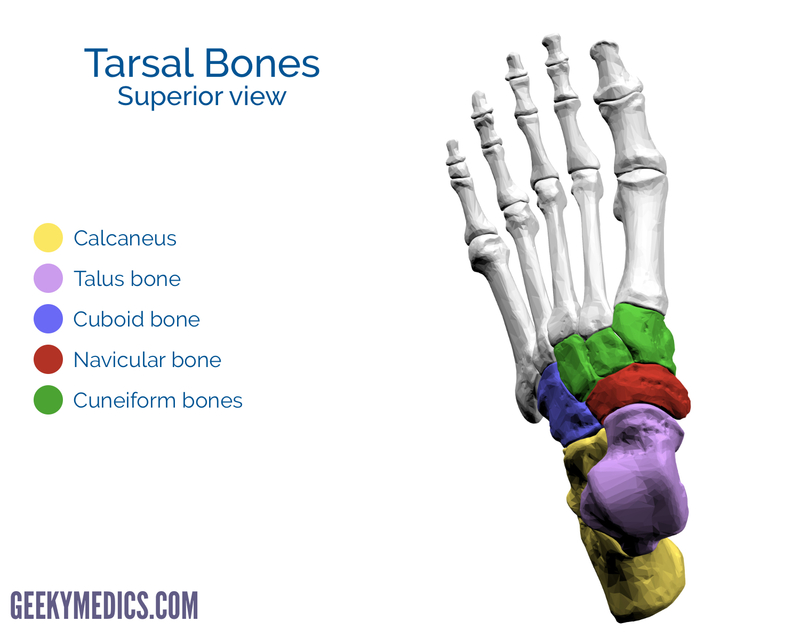 There are 7 tarsal bones, 5 metatarsal bones and 14 phalanges. Anatomically the foot can be divided into the forefoot (metatarsals and phalanges), the midfoot (cuboid, navicular and cuneiforms) and the hindfoot (calcaneus and talus). Injuries to the bones of the foot commonly occur in athletes and active individuals. Most injuries are the consequence of acute trauma during sports. Adolescents are most vulnerable to these injuries due to the incompletion of endochondral ossification and the existence of their cartilaginous epiphyseal plates. 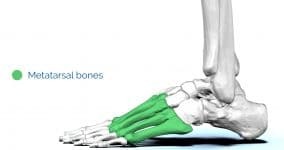 As such, it is important to have a basic anatomical knowledge regarding the bones of the foot, including their articulations and sites of attachment. The tarsus consists of 7 bones which make the posterior aspect of the foot: talus, calcaneus, cuboid, navicular and three cuneiforms. 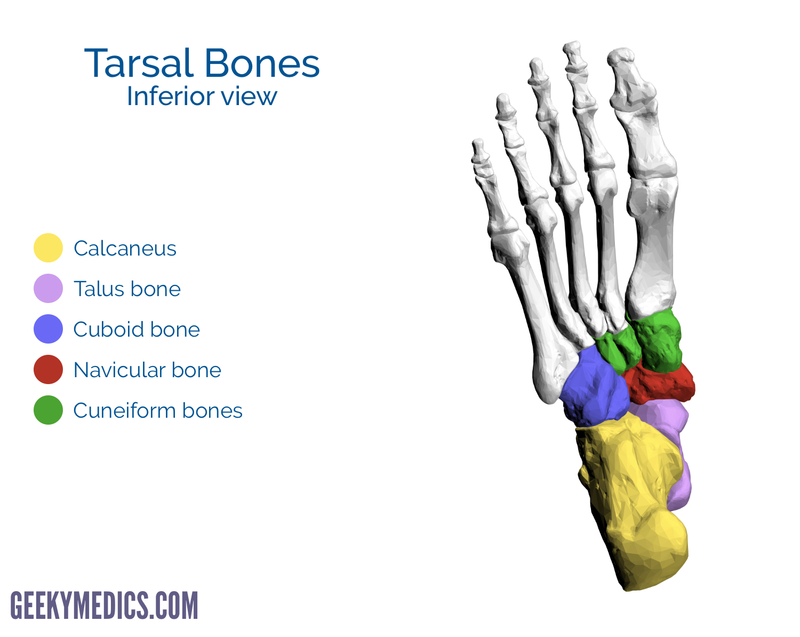 The tarsal bones can be divided into the hindfoot (talus and calcaneus) and midfoot (cuboid and cuneiforms). The navicular is the intermediate bone between these two groups. Anteriorly the talus articulates with the navicular bone. 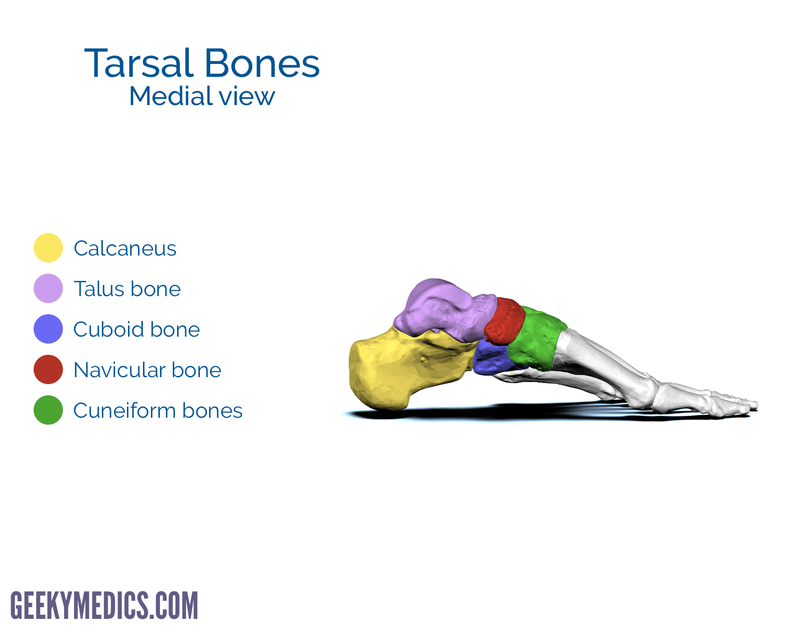 Medially the talus articulates with the intermediate bone of the talus. The talus has a body, head and neck. 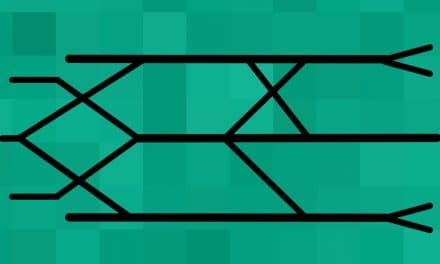 The superior surface, known as the trochlea, has the two malleoli attached which help with the stability of the joint. The trochlea is wider anteriorly, leading to a difference in stability depending on joint position. Dorsiflexion of the joint stretches the ligaments resulting in joint stability. Plantarflexion narrows the trochlea width resulting in decreased stability. 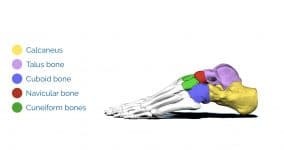 The calcaneus is often referred to as the heel bone and is the largest and strongest bone of the foot. The weight of the body passes through the tibia, into the talus and then to the calcaneus. The sustentaculum tali is a bony prominence on the medial aspect of the calcaneus which supports the medial aspect of the talus bone. The superior aspect of the calcaneus has three articular surfaces for articulation with the talus. 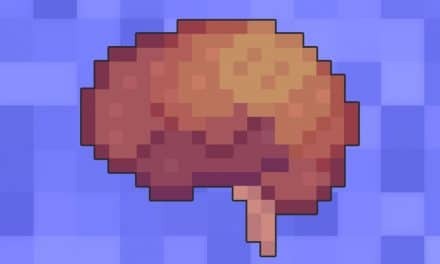 The anterior surface articulates with the cuboid. The posterior aspect of the calcaneus has a large weight-bearing region called the calcaneal tubercle. 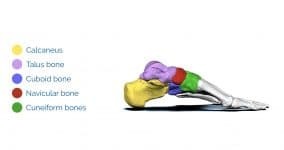 The cuboid bone posteriorly articulates with the end of the calcaneus. 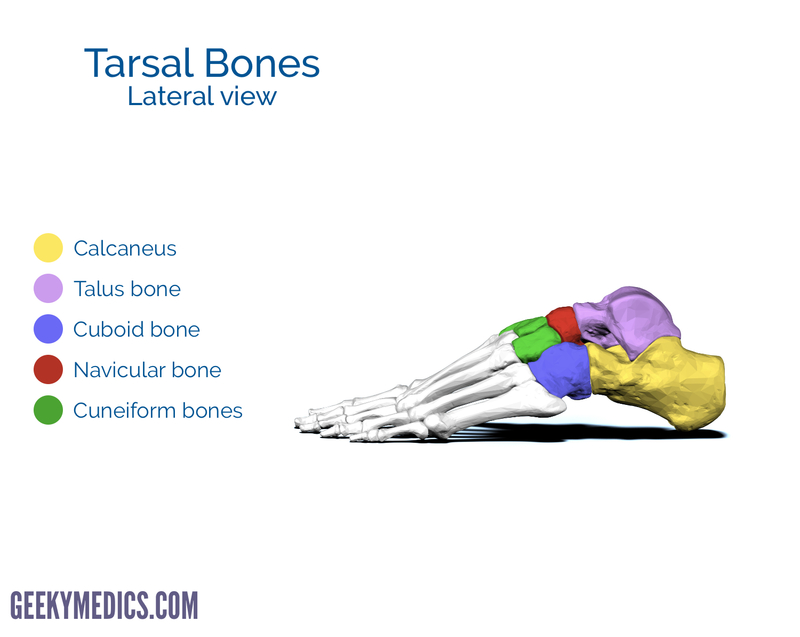 It is the most lateral bone in distal row of tarsal bones. Anterior to the cuboid tuberosity, on the lateral and inferior surfaces of the bone is a groove which provides passage for a muscle tendon. The navicular bone’s name is derived from its resemblance to a small boat. The navicular is located between the head of the talus posteriorly and the three cuneiforms anteriorly. The navicular bone is on the medial aspect of the foot and articulates with the talus proximally, the three cuneiforms distally and the cuboid laterally. 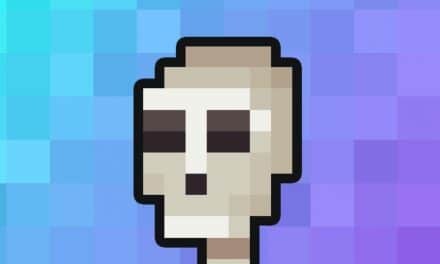 The cuneiform bones are wedge-shaped. 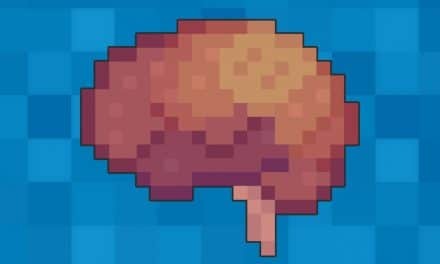 They are named medial, intermediate and lateral based on their relative position. Each cuneiform has a narrow inferior surface and a broad superior surface resulting in the transverse curvature of the foot. Each cuneiform articulates with the navicular posteriorly and their respective metatarsal anteriorly. The anterior portion of the foot is formed by the 5 metatarsal bones which are numbered 1-5 starting from the medial aspect of the foot. 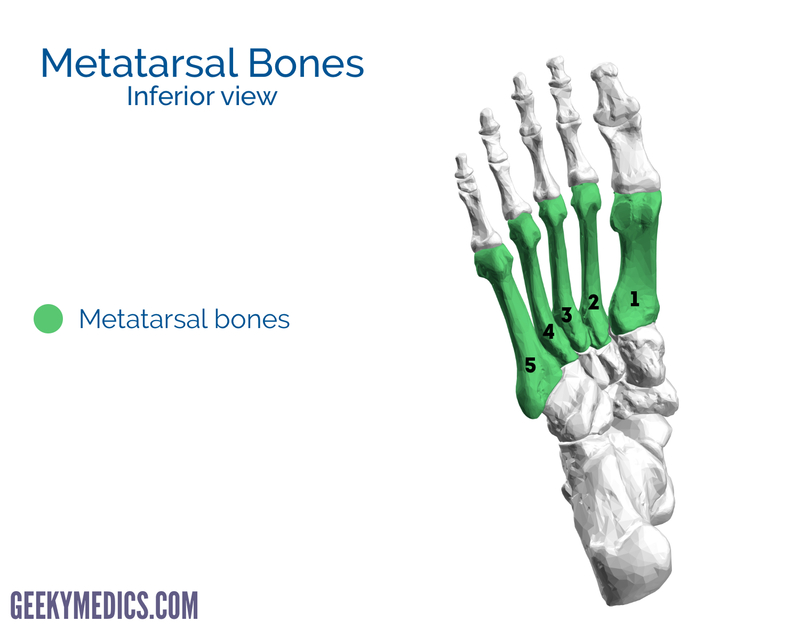 The first metatarsal is shorter and thicker than the others. 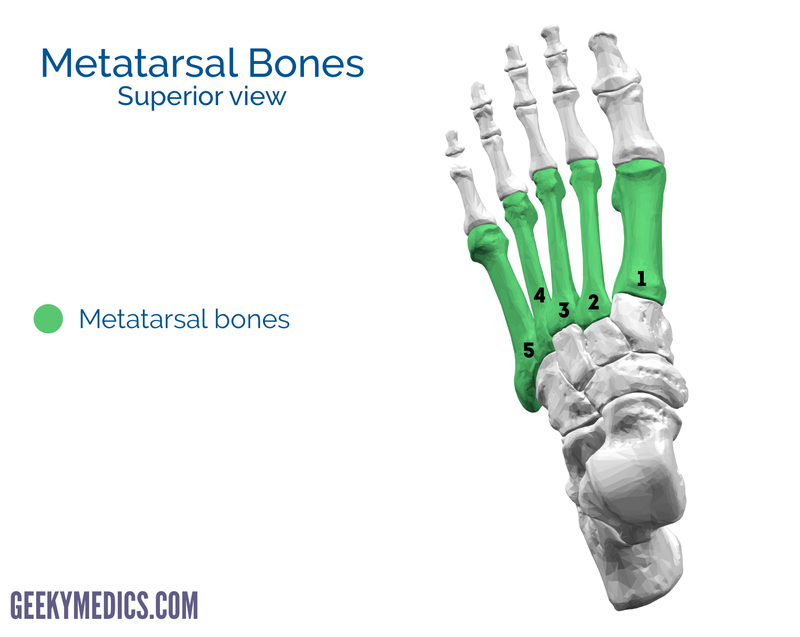 Each metatarsal has a base (proximally), a shaft, and a head (distally). 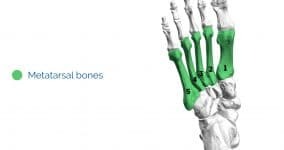 The base of metatarsal articulates with the cuneiform or cuboid bones. 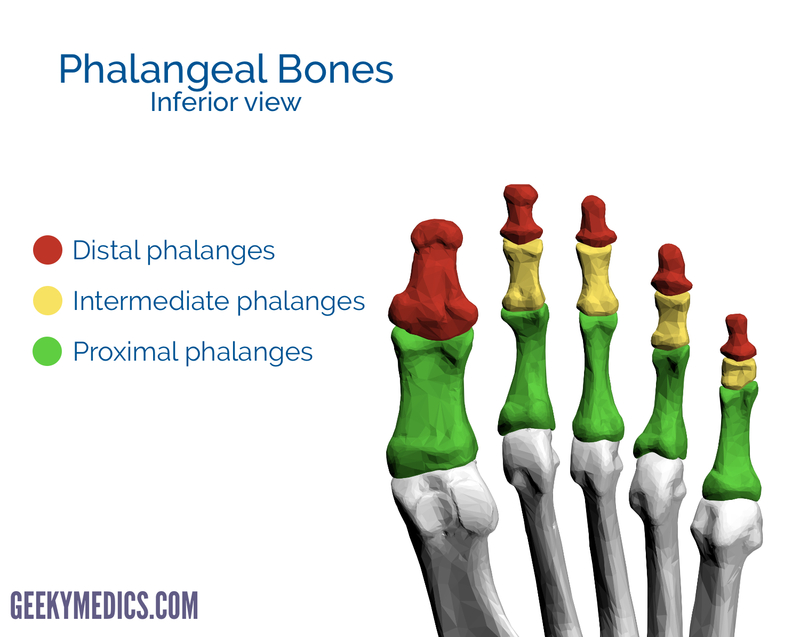 The head of a metatarsal articulates with the proximal phalanges to form the metatarsophalangeal joint (MTP). 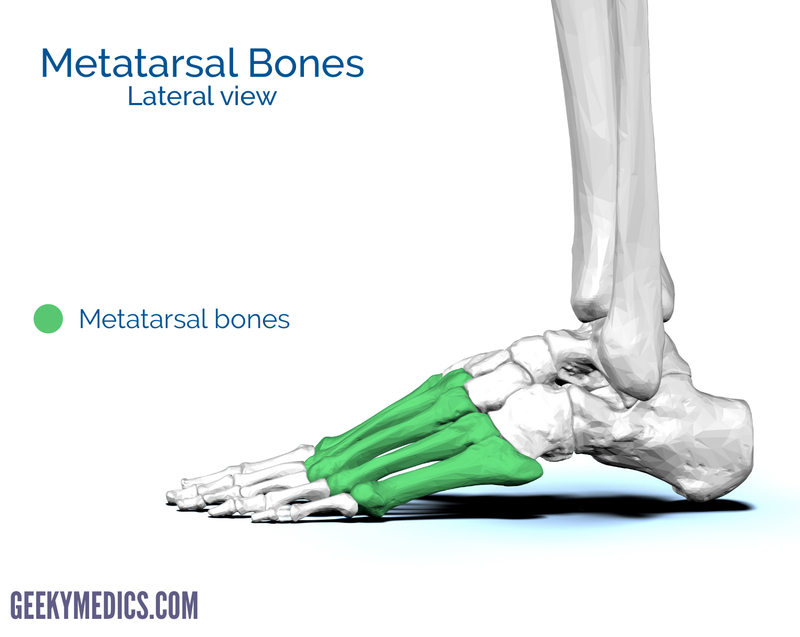 The heads of the metatarsals lie in contact with the ground forming the ball of the foot. 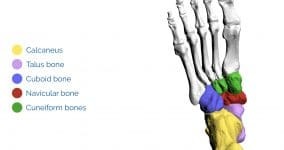 The bases of 5th metatarsals have a large tuberosity providing an area for tendon attachment. Fractures of the metatarsals typically occur when a heavy object falls on the foot. These fractures are common in football players either as a result of direct trauma or as stress fractures (“march fractures”). Finally, there are 14 phalanges in the foot which are arranged in a similar manner as in the hand. The 1st digit has two phalanges (proximal and distal) whereas the remaining four digits have three phalanges (proximal, intermediate and distal). 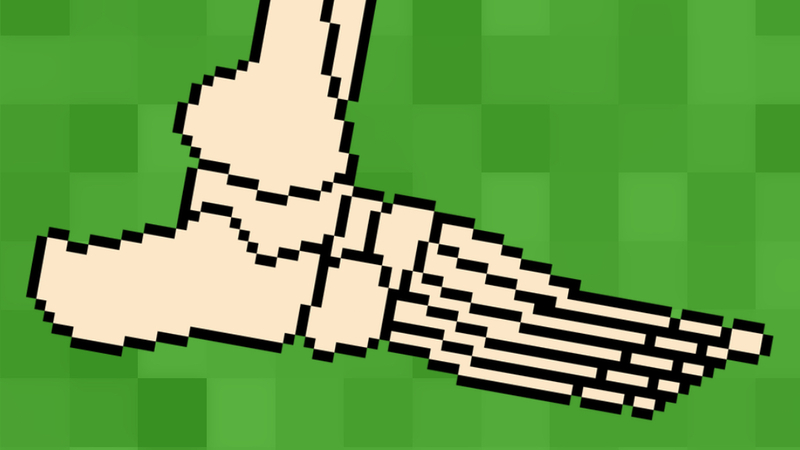 Like the metatarsals, each phalanx has a base (proximally), a shaft, and a head (distally). Like the 1st metatarsal, the first phalanges of the first digit are short and broad.